I only need to say the word “Goldfish” for most of you know where this is going. Yep! As a child I had a Goldfish I called Jaws (yes I know it wasn’t very unique) And that dreaded day came when Jaws died and he was flushed down the loo never to be seen again. But growing up in children’s home means that the other kids sometimes said nasty things! I was told he would come back to life and bite my bum when I was sat on the toilet! So please hold my hand as I try to take a look at all those horrible, mutated and scary animals that live in drains and maybe try to find out just what happened to my poor old Goldfish…. Apparently in Michigan, USA it is quite common for Raccoons to live in drains and drainage pipes, Sadly this poor guy got his head stuck, but as you can read all about in the link he was fine once he was freed. But he is also the first sign that drain dwelling creatures might not be all that they are made out to be! Seen right here in the UK these simply amazing images that were captured by someone on their way to work! 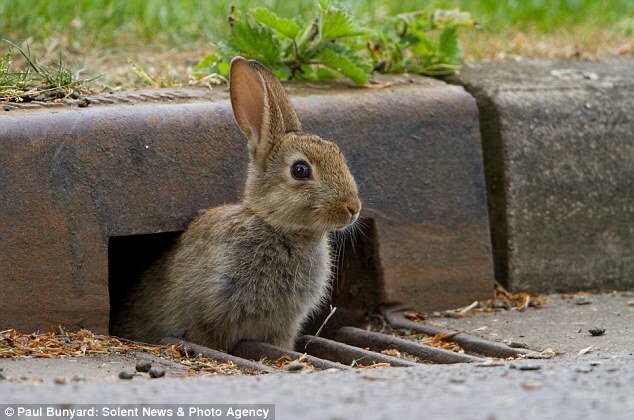 Poor little drain bunny. 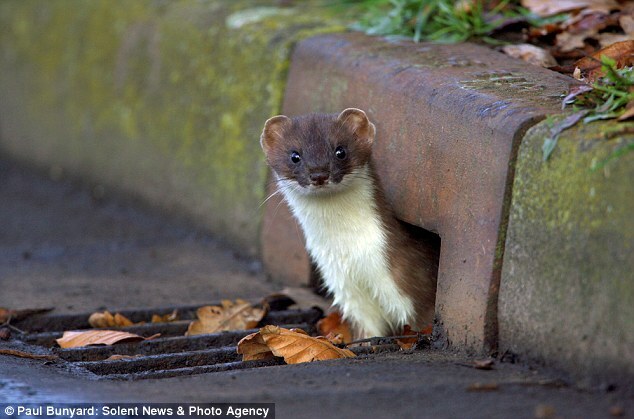 It doesn’t get much stranger than this awesome image of a stoat (a sort of weasel) that lives in a drain! For some reason I get the feeling that this blog page is turning into “Wind in the willows” rather than scary drain creatures! 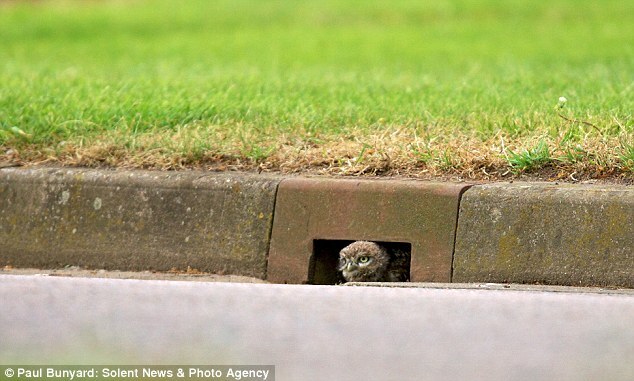 I swear that this is a real image and has not been Photoshopped in anyway, what you really are looking at is a whole family of Barn Owls that do in fact live in a drain! Maybe they ate my Goldfish! It is not looking good for my fish! What you see above is in Spain and apparently they have several hundred thousand homeless cats wondering around in their sewer! But with the kindness of strangers and strange cat people 99.9% of them get to eat at least once a day. 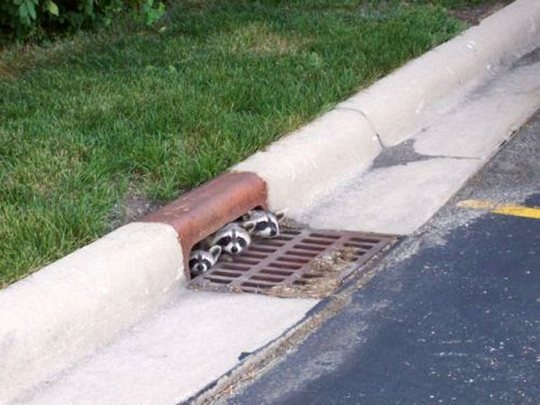 I know I had a Racoon already in this list but this amazing image of an entire family of them sticking their little heads out of the gutter just had to be included. Bless em! I wonder if they know what happened to my goldfish! Before anyone starts shouting “RAT” read the story in the link because this in reality is Marmot and is in fact lost but had been living in the drains for quite a while before anyone realised it wasn’t in fact a rat. This is in fact one of two cows which fled an abattoir in northern France. It was found ‘hiding’ in a drain, was rescued and you will be happy to hear given a chance to live out the rest of its life in a field. Sure it was hiding in a drain but it does have a happy ending! 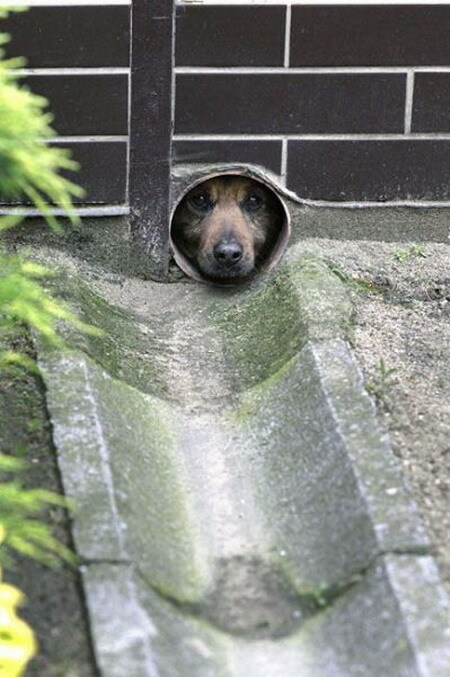 While it might seem like he is stuck, he is in fact stood inside a much larger drainage system. Seen in Paris France apparently several wild dogs will roar the streets and sewer pipes and networks looking for food. There are apparently hundreds of thousands of chipmunks that live in drain and sewers of their native countries and they have even been known to become friends with the much larger rat population! So while I didn’t find my Goldfish at least he is not alone and might even make a friend or two.